8 weeks for design concept and documentation, 4 Months for construction. The goal of this design is to use the landscape as the play setting and nature as the play material. 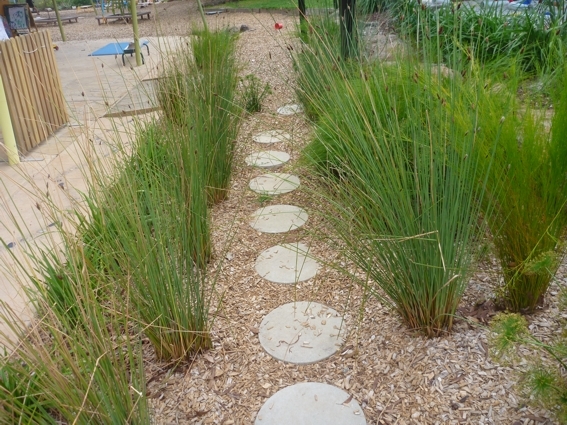 This is done by creating a space which uses the natural topography of the site, and responds to it by creating a series of gently graded paths and terraced level areas. 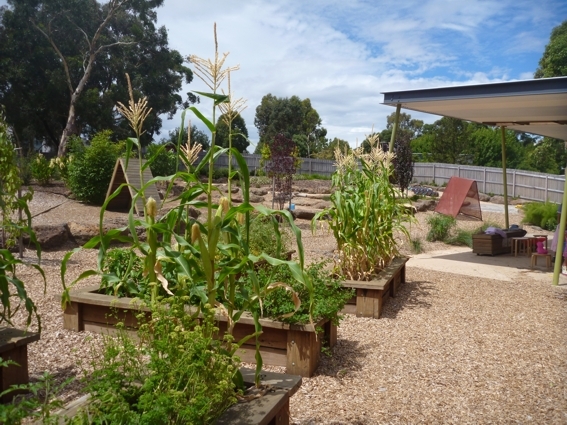 Vegetation is carefully chosen and planted to create areas of different scale, provide sensory stimulation and to provide material used in play. 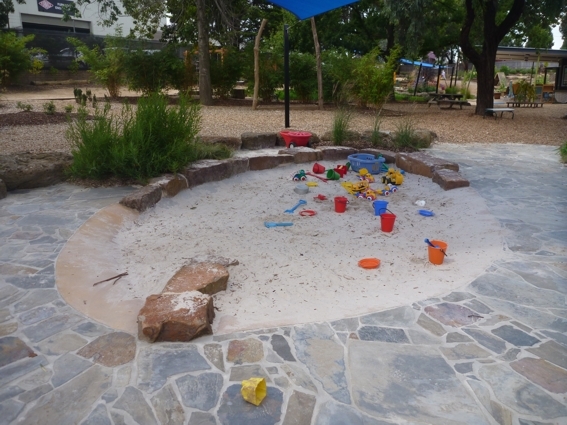 There are orchard and vegetable areas, sensory gardens, two sandpits, three digging areas, two swings and a bike path. There are also 3 small tanks which supply water for wet play, and 3 large tanks which capture water for irrigation. Another interesting feature of the site is the engraved slate, where children had their names engraved alongside pictures of animal and plant shapes. The majority of the lower storey plants were native, while the trees were a mixture of native and exotics. Many plants chosen have seasonal qualities to help teach the kids about the seasons. 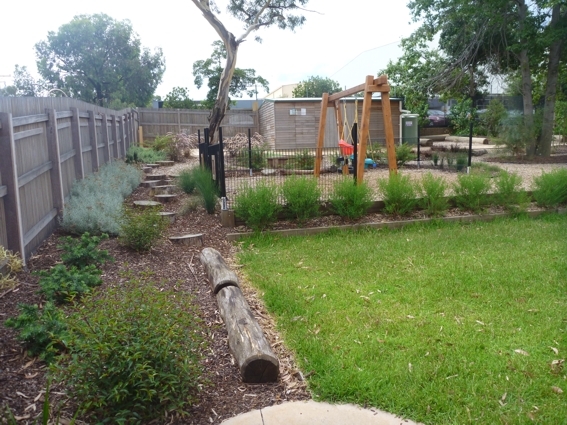 It is hoped that the centre will engage a horticulturist to come in and run outdoor classes, where the children actually participate in some aspects of the maintenance of the landscape. We hope that we have provided a stage where children can take control of their play activities, to stimulate imagination and to conjure personal expressions from within themselves. We also hope that the play space is not static and evolves in response to the children, environment and philosophy of the centre. 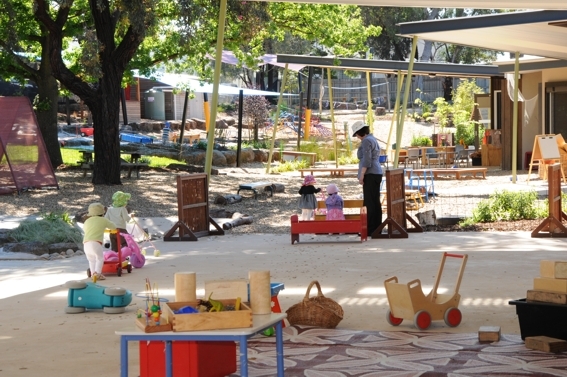 An outdoor environment and the programs that are planned in them provide unique opportunities to develop and extend children's skills and concepts as well as fostering a sense of excitement about learning and attending their future schools. In addition to physical development, outdoor play also supports social development and provides children with opportunities for the development of self-esteem and confidence in their own abilities. This approach strives to achieve all of these characteristics through sensory and intellectual nourishment where children can learn by 'creating' and 'doing'. This project had a tight budget and limited timeframe.